It’s only appropriate that getting Grant Gustin and Stephen Amell into each others costumes—and oh, like, the arrival of Batwoman herself on TV—is marked with its own comic book cover. Last year’s Crisis on Earth-X has seemingly kicked off a new tradition for the CW’s now-annual smushing together of its DC heroes: creating a comic book ouroboros by giving these live-action versions of comics characters their very own special cover. This year, DC has revealed that artist Amy Reeder was given the task of bringing Elseworlds to life, and it’s a pretty delightful mashup of our heroes and the sinister villains seemingly behind this multiversal chicanery. 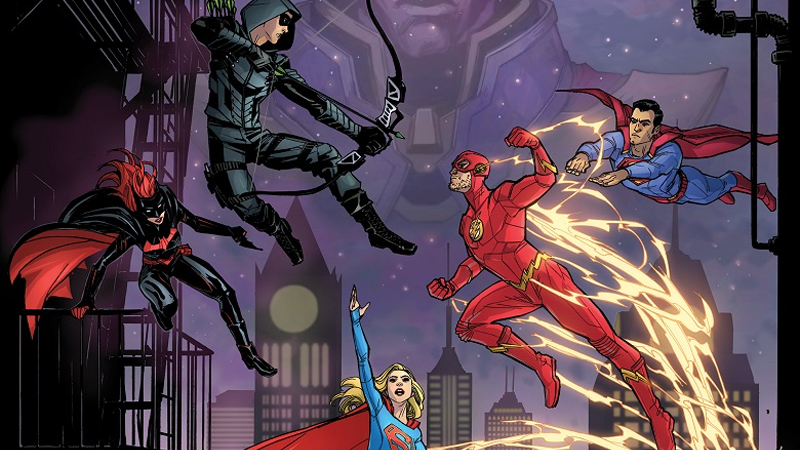 As well as depicting Supergirl, Superman (not in his new black suit), Batwoman, and the bodyswapped versions of Green Arrow and Flash, the cover includes LaMonica Garrett lurking in the background as the Monitor, and our first look at Jeremy Davies’ character, Doctor John Deegan, a mysterious figure who works at Arkham Asylum and is apparently the catalyst that brings our heroes together and to Gotham in the first place. While it might not have quite so much of the “everyone is here!” vibes of the Phil Jiminez art created for Crisis, it’s still a great little cover filled with cute nods—right down to even borrowing Elseworlds’ titling from the comics. Alas, this is just promotional art, there is no actual comic: you’ll have wait until Elseworlds kicks off on The Flash December 9.